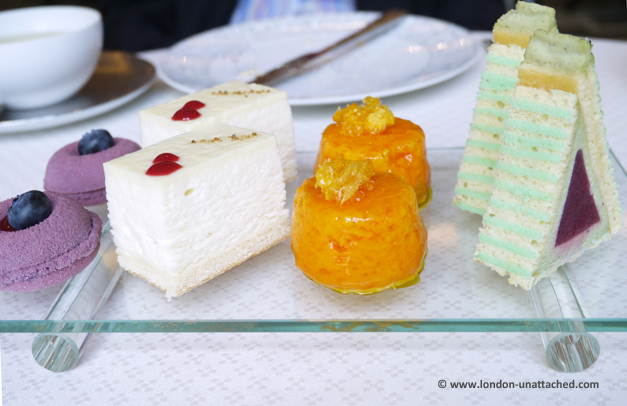 All the way along Park Lane, the grand hotels serve afternoon tea. It’s a very British institution and there are certain elements that shouldn’t ever be changed. 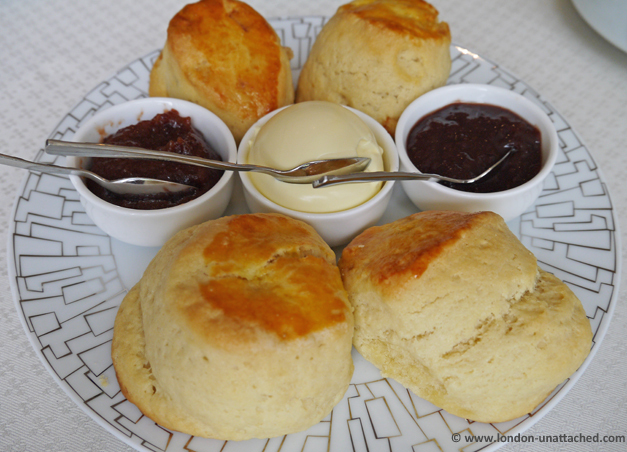 The scones should be just warm and fresh out of the oven, the sandwiches delicate and the cakes decadent. It is a treat, not something to do every day, and so indulgences like clotted cream and champagne can be totally forgiven. I remember as a child aged about three or four being taken for tea with my mother and grandmother. Our waitress wore a black dress, a white apron and a frilly cap and smiled a lot. She asked me what my name was. It must have been a bad day. We’d probably been shopping for clothes and other boring things. I’ve been told that my mother blushed but all the surrounding tables thought it was extremely funny. Anyway, afternoon tea can bring a smile to the face of even the grumpiest child and I am sure I left happy. A traditional afternoon tea is very much a meal in its own right and you would be foolish to eat much for lunch or plan an early supper afterwards. 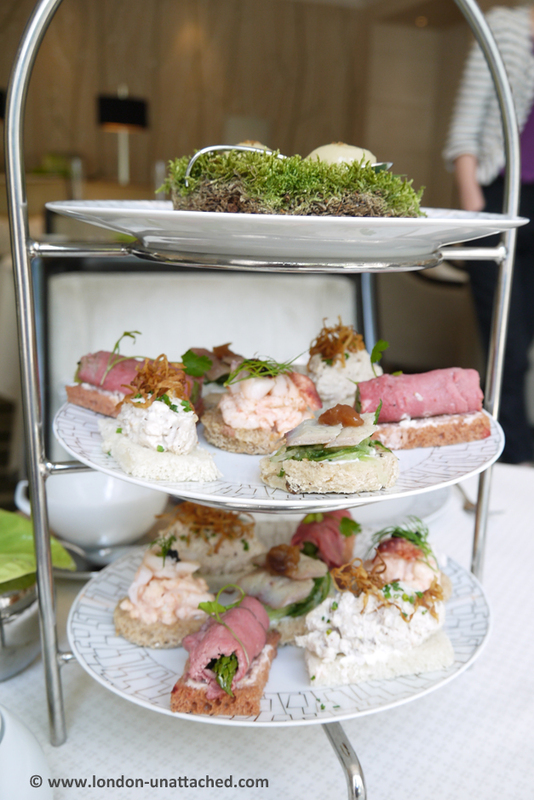 At the Intercontinental Hotel they offer a selection of afternoon tea menus which, at the moment includes a celebratory jubilee tea (with the Queen’s favourite coffee and walnut cake and a Victoria sponge) and the botanical tea that we enjoyed last week. The term botanical comes from the use of herbs and flowers to infuse the dishes, so for example, the asparagus is infused in nettles! 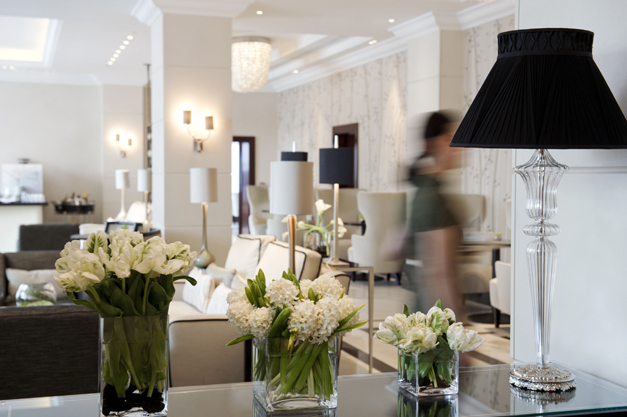 The Wellington Lounge where tea is served is light, airy and quite modern with large windows looking out over Hyde Park fitted with that special glass that lets you look out but not be watched. Table settings are modern, chairs squishily comfortable. And the staff wear rather pretty green chic green dresses. The overall effect is charming and very relaxing, with no hint of stuffiness. Our tea started with a champagne cocktail. 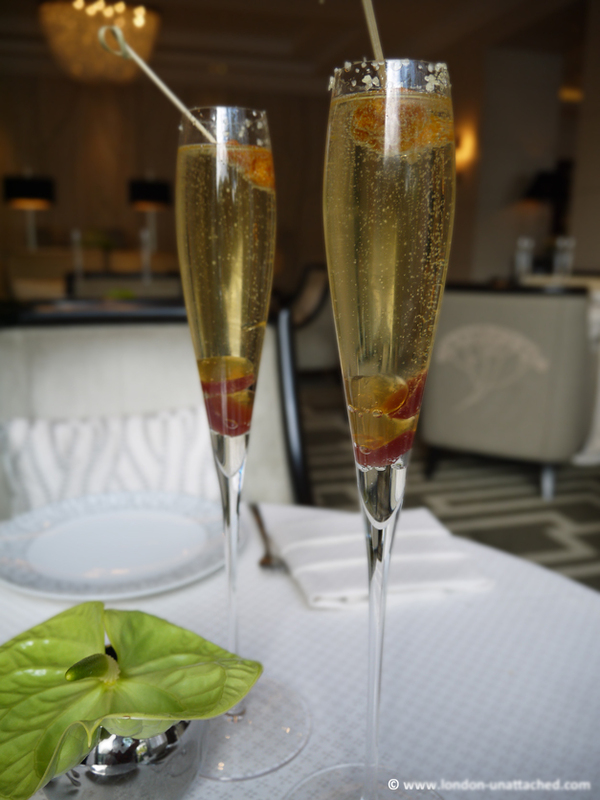 The glass was topped with popping candy and the champagne was mixed with a strawberry jelly that gradually dissolved, all to celebrate Wimbledon. Then a palate cleanser made with Kentish pears, sprinkled with juniper. 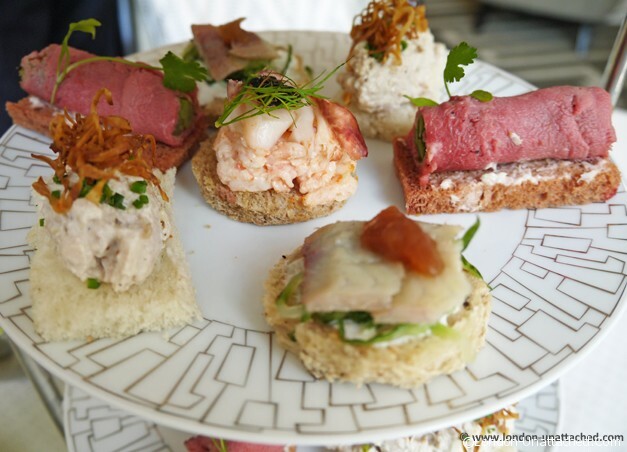 Open sandwiches included a delicious beef and asparagus on beetroot bread and an extravagant lobster and prawn sandwich with caviar. There’s a great choice of tea to accompany your food as well. I’ve taken rather a liking to silver tipped jasmine tea but if you prefer a stronger blend, the hotel has their own Wellington blend and No 1 Park Lane – A black tea blend of “Madagascan vanilla pods and marigold flowers”. Scones were light and moist. The botanical tea offers plain scones and ones with citrus peel. They were as you might like them to be if you made them yourself! And there’s homemade quince jam as well as a more traditional strawberry preserve and clotted cream. The cakes looked as if they might have dropped out of Willie Wonka’s Chocolate Factory. And, they have intense yet light flavours. My personal favourite was the blueberry macaron with a gooey melting centre. So, if you are looking for an afternoon tea that combines the best of tradition with modern cuisine, allows you to sample some innovative flavour fusions and enjoy champagne and a wide range of teas, all set in a light, classic and comfortable environment, the Botanical Tea at the Intercontinental Hotel should be on your list. It will cost you a little under £40 for unlimited tea, a champagne cocktail and rather more to eat than a set lunch. Disclaimer. We ate as guests of the restaurant. 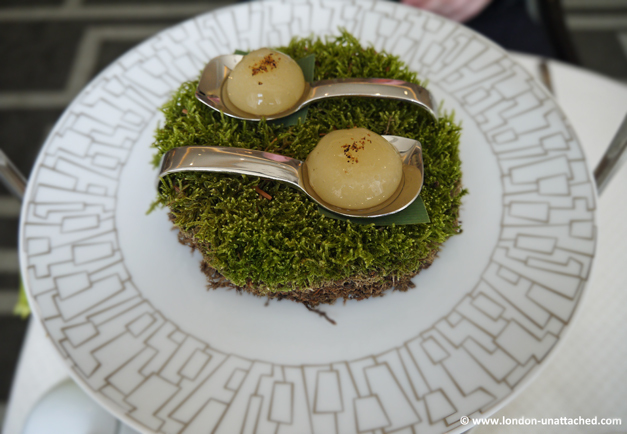 However, I was lucky enough to enjoy a tea there two weeks previously and I can confidently say the service and food was exactly the same standard! Nothing like a good British afternoon tea and this is somewhere I would not have thought to visit. Sounds and looks divine!